This comfortable holiday flat (60 m²) (one bedroom, sleeps four = 2 doubles), with its little patio garden,has central heating and air conditioning and wifi. It lies in the old village of Cucugnan in a valley between two ridges crowned with two of the famous Cathar castles. Its Mediterranean climate is ideal for vines and the main local activity is wine making. The villages here have their own wine "caves", where you can taste the local wines, some of which are from rare grape types unique to this region. The official Cathar Castle footpath comes througn Cucugnan (there is even a fell-runners' marathon in May). Cycling, Quad biking, horse-riding and para-penting are available here. Carcassonne, Narbonne and Perpignan are in easy reach, even Barcelona (one hour by new TGV from Perpignan.) Rennes-le-Chateau (in Da Vinci Code) is nearby. The village is tiny, but contains three good restaurants and one of the best organic bakeries in France. But most memorable are the thousand-year-old fortresses, the wild scenery and the breath-taking views. I am happily settled in France after several years of wandering in a boat round the French canals and the Med. Before that I was teaching languages in Devon, and I have taken up my teaching again here. A lover of history and of the hills, (and of good food and wine) I am well suited here, and I enjoy talking about the places to visit and their history with anyone interested. The bathroom is not en suite, and contains a bathtub (with shower fitment), basin and toilette. The washing machine is in the bathroom. Outside: There is a small sitting out area directly outside the bedroom, and there is also a patio-style garden, equipped with table and chairs, ideal for sitting out in the evening, or for meals. Cleaning / Towels / Linen : Unless specifically requested, the bed linen and towels are changed at the end of every week. Other: There is a separate room for hanging clothes for those sleeping in the living-room. What a delightful time we spent in Claire's appartment in Cucugnan! It is clean, well equipped and very comfortable with a small garden where we sat sipping local wine each evening. Nothing was too much trouble for Claire (She lives above.) and she was not only very welcoming (offering us glasses of her favourite wines accompanied by delicious snacks and home-made savoury tart) but provided us with a 'starter-pack' of basic food essentials. She was also an endless source of local knowledge and useful information. The village, which hugs a hill, with a windmill on top, has a choice of three restaurants and a couple of bars that offer a range of delicious food; a grocery store/post office; a bakery (producing artisanal bread), a few small pottery/craft studios; several little souvenir shops, a winery and a honey producer. There is everything you need on site so sorties to bigger towns are not necessary to buy supplies and gifts. We came home laden with local wine,and honey, colourful bowls and home-made soap. The surrounding countryside is magnificent with stunning views from the village. We walked for miles every day; swam in the cool, clear rivers and did our cultural bit when we visited Queribus and Peyrepertuse Chateaux perched on the top of rocky outcrops nearby. There are weekly markets on different days in surrounding towns and 'vide grenier' events, too. In fact, there was so much to do, that we ended up reading a lot less than usual! To top everything, the weather was superb. We wanted for nothing and we highly recommend both the place and the appartment for a blissful break. Thank you Claire for looking after us so well. It is always a great pleasure for an owner to see so many of the positive and interesting points, both of the accommodation and of the area, mentioned and appreciated. I am all the more encouraged to continue "look after" all my future guests. Thank you. We had a truly wonderful stay in Cucugnan. The village is charming and the area brimming over with history, interesting walks and fascinating places to discover. Tips and local knowledge provided by Claire, the owner, made our holiday even more enjoyable. We would highly recommend not only the area but Cucugnan and this apartment in particular. A memorable week. A great place to base yourself in the area. The two castles in the valley both well worth the visit. A great host and a well presented place to stay in an amazing little hilltop town. Thanks very much. We recently spent five days here and would highly recommend it as a base for exploring the stunning countryside and historic sites nearby, in particular the Cathar castles. The approach to Cucugnan is very dramatic coming from the south, as there is a steep climb up towards Queribus (the nearest castle, built on a vertiginously high rock), then a descent towards the village, which sits above vineyards. On arrival we found the flat (it's actually on two levels) to be very clean, comfortable and well-equipped, and the owner had thoughtfully bought some fresh supplies for us, besides what was in the store cupboard, including milk, butter and delicious bread from Cucugnan's famous bakery, next to the windmill. She also invited us in for a drink so we could sample a couple of the wines drunk as aperitifs locally, and told us some more about the village and what to look out for. The bedroom, which is on the lower level, opened onto a small terraced garden overlooking the beautiful landscape. Cucugnan is a very pretty village, not overly busy in early July, with three restaurants, all good but one in particular served real gourmet food and we would recommend eating there at least once as a not overly expensive treat. We really enjoyed our stay and would love to go back one day to see more of this fascinating part of France. Language courses are available, since the owner is a professional teacher of French and English. The Mediterranean beaches are an hour away by car. The coastline eastward from Cucugnan is one long beach, with several resorts and marinas. The picture postcard fortress harbour and artists' paradise of Collioure is about an hour and a half, and just beyond it is the fishing port of Port Vendres known for its seafood. A car is a must in this area, unless you really do want simply to retreat and "chill out" in the sun! The nearest airports are Perpignan (40 minutes by car) and Carcassonne (90 min.) Two or three hours' drive away are Beziers, Nimes, Montpelier, Toulouse, Girona and Barcelona. 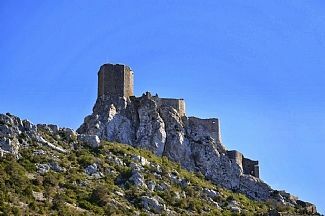 Cathar history : Cucugnan lies between two of the famous "Cathar Castles", and others are within easy reach. There are books available here to give you an insight into the Cathars, and Kate Moss's novel 'The Labyrinth' gives some background to the main events of the Anti-Cathar Crusade. The village boasts three good restaurants and famous windmill and bakery where the bread is made from locally grown, organic flour derived from traditional grains, including spelt (the grain of the ancient Romans) and kamut (the grain of the Pharoahs). The flour is freshly ground as requiired, and the bread is baked in a wood-fired oven; you can watch, (and smell !) the bread as it is taken from the oven, just as it was in ancient times. This is a wine-growing area and most of the local wine producers offer free tastings; some of the grape types are unusual, and all are interesting. The local rich red wines regularly win prizes for quality, and the sweet dessert wines (Muscat de Rivesaltes, Maury, and others) are a special treat. Luckily there are lots of wonderful walking, or cycling, routes to explore to balance out all the eating and drinking ! Booking Notes: A single payment of 100% of the rental secures your reservation. ! Changeover Day: Changeover day is normally Saturday, but, if bookings allow, the owner is happy to be flexible, even in July and August. Notes on prices: €450 per week, July and August and September; otherwise from €300 to €400. Even in July and August, shorter stays may be booked, but the minimum price, for three days or less, is between €150 in winter and €195 in high summer..